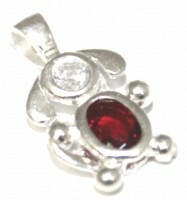 Sweet & sterling silver, these pups feature the birthstones of your pups. Image is enlarged to show detail. Please allow 1 to 2 weeks for delivery.